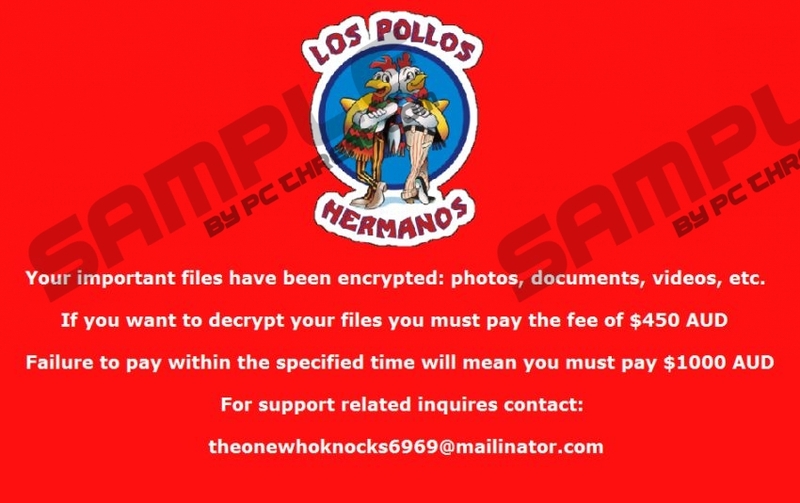 Security experts have noticed that a new ransomware infection called Los Pollos Hermanos has emerged. Even though this threat is really known to be Trojan.Cryptolocker.S, it is called Los Pollos Hermanos because it uses the theme of the famous TV show Breaking Bad. Specialists working at pcthreat.com have revealed that this ransomware is mainly aimed at Australian computer users; however, there is still a possibility that you might encounter it if you live somewhere else but use an Australian IP address. It has to be also mentioned that it affects Windows OS only. It is very important to remove Los Pollos Hermanos ransomware from the system as soon as possible, if it happens that it slithers onto PC. Unfortunately, it is not an easy task to do that. Research carried out by our specialists has shown that Los Pollos Hermanos will encrypt various photos, videos, documents, and other files in order to extort money from users. In addition, it will place a message informing that all the major files have been encrypted and will ask to pay a ransom. In most cases, users have to pay a ransom of $450 AUD; however, this sum of money might grow up to $1000 AUD. We understand that you want to gain access to your files as soon as possible, but we still do not recommend paying money because you will lose your money and nobody knows whether you will really receive the key for the decryption of your files. As can be seen, Los Pollos Hermanos acts like previously published ransomware infections (e.g. CryptoTorLocker2015 and Cryptowall); however, it is unique in a sense that it uses Breaking Bad theme, plays music in the background, and provides users with the video explaining how to make a payment in Bitcoins. According to the specialists at pcthreat.com, Los Pollos Hermanos ransomware uses social engineering techniques to infect computers. It has been observed that it enters the system via malicious .zip file. This .zip archive usually contains a malicious file PENALTY.VBS. If users execute it, Los Pollos Hermanos ransomware is downloaded on the system. We do not think that you want to infect your system with a similar infection in the future, so we suggest installing an antimalware tool on the system as soon as possible. Check whether the tool that you are going to install is 100% trustworthy because there are hundreds of untrustworthy tools on the web. Los Pollos Hermanos ransomware is a serious computer infection, so it is very difficult to remove it manually. Luckily, a trustworthy antimalware tool, such as SpyHunter, will help you to delete this threat. You will simply have to download it, install it on the system, and perform a system scan. It is likely that you will be able to download SpyHunter normally; however, if this threat does not allow you to access your browsers, use our instructions in order to download the security tool. Actually, it is worth investing in a trustworthy antimalware tool because it will not only remove all the infections from your PC, but will also protect your system from malware. Click on the Power button located at the Windows login screen or the Settings charm. Press and hold the Shift key on your keyboard and click Restart. Select Troubleshoot and click Advanced options. Tap F5 on your keyboard to start Windows in Safe Mode with Networking. Launch your browser and visit http://www.pcthreat.com/download-sph . Download SpyHunter, install it, and scan your PC. Restart your computer and start tapping F8. Use arrow keys to select Safe Mode with Networking from the Advanced Boot Options menu. Launch your browser and go to http://www.pcthreat.com/download-sph . Download the tool and perform a system scan. Reboot your PC and start tapping F8 immediately when BIOS screen disappears. Select Safe Mode with Networking and tap Enter. Click Yes. Open the Start menu and click RUN. Enter msconfig and click OK. Select the Startup tab and then click Disable All. Click OK. Install SpyHunter on your computer. Perform a system scan in order to remove Los Pollos Hermanos ransomware. Quick & tested solution for Los Pollos Hermanos removal.